This notice in the New York Times, 18 Jan. 1922, announced the purchase of land at Broadway and 91st St. that led to the Greystone Hotel, "The southeast corner of Broadway and Ninety-first Street, one of the largest and most valuable plots left in the west side residential section, was sold yesterday by the Astor estate to Samuel and Henry A. Blumenthal, builders and operators. It is the intention of the buyers, who have been active in this section, to improve the site with a fifteen-story apartment house or hotel. The property acquired, which is assessed by the city for taxation purposes at $500,000, consists of six and a half lots, with a frontage of 101.8 feet on Broadway, and measures 162.8 feet on Ninety-first Street. It is the last plot in the two square blocks in this section formerly owned by the Astor interests and held intact for more than fifty years. The Wood-Dolson Company negotiated the transaction, which in its entirety, including construction costs, will involve an outlay of close to $2,500,000. The same buyers recently purchased from the Astor estate the plot of twelve lots on the west side of Amsterdam Avenue from Ninety-second to Ninety-third Street, on which they are erecting two elevator apartment houses." Of the original developers, Samuel Blumenthal died in 1925, and his son, Henry Arthur Blumenthal (1883-1950), continued his involvement with the property. Henry A. Blumenthal was listed as president of Hotel Greystone Inc. in Polk's New York City Directory in 1925. This ad for the Greystone appeared in the New York Times, 1 June 1924. Architects of the 14-story Hotel Greystone were Schwartz & Gross. As mentioned at nyc-architecture.com, "The firm of Schwartz & Gross was among the most productive New York architectural firms in the first half of the twentieth century. Both graduates of the Hebrew Technical Institute, Simon I. Schwartz (1877?-1956) and Arthur Gross (1877-1950) began their lucrative practice in 1902. From the beginning the partners specialized in hotels and apartment buildings, particularly luxury buildings with ample plans and generous proportions. The work of Schwartz & Gross is found throughout the city, but particularly on the Upper East and Upper West Sides and in Morningside Heights." The Hebrew Technical Institute was a vocational school located at 34-36 Stuyvesant St. (later Stuyvesant Place) established in 1884 that closed in 1939. Notable among other Schwartz & Gross architectural designs are Colosseum Apartments (1910), southeast corner of Riverside Drive and 116th St., and Hotel Lincoln (1928), east side of 8th Ave. between 44th St. and 45th St.
One of the Greystone's most distinguished residents was Alberto Arroyo (1916-1910). Alberto was an extremely well-known figure on the pathway around the Central Park Reservoir. Wearing what appeared to be an Olympic medal around his neck, running (and later, walking, then limping, and finally in a wheelchair) around the pathway, which joggers appropriated for their personal use in the 1960s, Alberto was friendly to everyone and well-liked.. This story in the New York Times from 1985 does not mention the medal. His obituary appeared in the Times, 26 March 2010. Grandpa's Postcards at blogspot.com shows a postcard of the Greystone in 1952. "500 Fireproof Rooms" and "The Friendliest Bar in Town!" The subway stop at 91st St. has been closed for some years now. 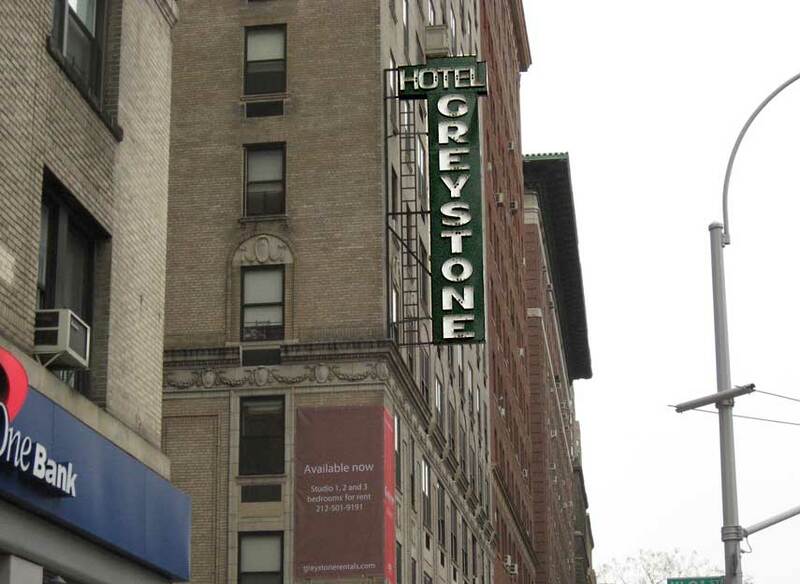 In 2003 this was the canopy over the entrance to the Greystone on 91st St. In 2013 the Greystone neon was glowing in the early evening light.